The label society puts on individuals with physical disabilities is one that refers to struggle and being needy. Some people even automatically assume that if a person has a physical disability they also have a mental disability as well, and you couldn’t get further from the truth. There are so many great motivational speakers, artists of all kinds, and in all other professions that know more than the average able-bodied person. There is so much we can learn from one another, and that can be applied around the world. 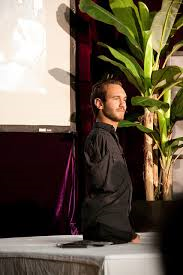 One of my favorite speakers is Nick Vujicic. Nick is an Australian Christian evangelist and motivational speaker born with tetra-amelia syndrome, a rare disorder characterized by the absence of all four limbs. The mentality that society has today regarding people with disabilities would look at someone like Nick and start to question and think about what he is not able to do instead of what he can do and what he is doing with the life God has given him. He can swim, get around, feed himself, and he is even married and has a precious daughter. So often we look at someone and automatically think about what they can’t do, instead of admiring God’s handiwork, see what they can do, and knowing that He did not make a mistake. We hear stories all the time about people with physical disabilities in the Olympics/Paralympics and famous people with learning disabilities such as Einstein, Tom Cruise, Stephen Hawkings, Beethoven, George Washington, Thomas Edison, and the list goes on. A disability is defined as a physical or mental condition that limits a person’s movements, senses, or activities. So if we were to take the literal meaning of this, then every single person would be known as having a disability. A fear is a disability because it inhibits us from doing something. For example, if I had a fear of heights that would limit me from skydiving or possibly even getting on a ten-foot ladder. If I were claustrophobic I wouldn’t want to get in an elevator and I would have to take the stairs. One disability should not be distinguished or highlighted more than another. If we look close enough, we all have a disability, and the truth is that having a closed or judgmental mind is also a disability. We are all people with disabilities, some more visible than others, therefore we should all be considered normal just doing life in different ways. Brittani Carter- I am a recent Samford University graduate with a Bachelor of Science in Exercise Science. I currently work at Andrews Sports Medicine, and am in the process of applying to PA school to pursue my goal of becoming a surgical PA in orthopedics.